Lachnus longirostris was originally confused in the literature with Lachnus iliciphilus, a species of southern France. 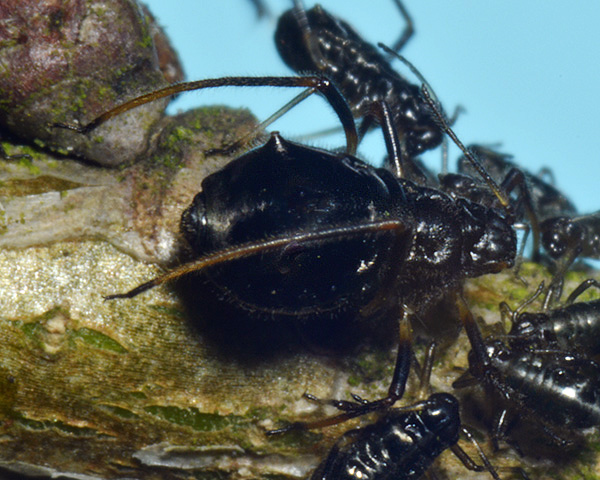 There is good recent DNA evidence that Lachnus longirostris is conspecific with Lachnus pallipes but, until this is confirmed with breeding and host transfer experiments, we continue to treat them as separate species. Apterae of Lachnus longirostris are shining dark reddish to blackish brown (see first picture below). The antennae are 0.4 - 0.5 times the body length. The abdominal dorsum is densely haired with long, fine-pointed hairs (cf. Lachnus roboris which only has a few short hairs on the dorsum). The middle parts of the hind tibiae are pale (cf. Lachnus roboris which has the hind tibiae pale at the base, but progressively darker over most of their length). In addition the hind tibia has very long and fine hairs on the ventral side of the distal part of hind tibia, greatly exceeding the width of the tibia. The siphuncular cones are rather small. The body length is 2.4 - 5.0 mm. Lachnus longirostris alatae (see second picture above) have a pattern of forewing pigmentation similar to Lachnus roboris, but with the clear area between Rs and media extending to meet the media. Scarce variegated oak aphids are found on twigs and branches of oak (Quercus species). A very similar species Lachnus pallipes occurs on beech. 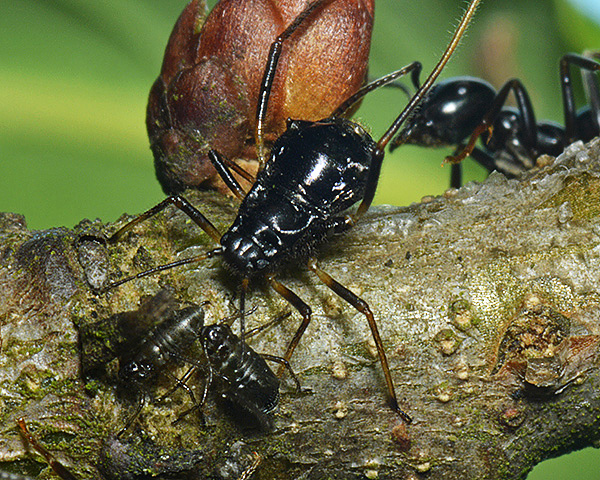 The differences between the two species are mostly size-related and they are considered by some authorities to be the same species feeding on different hosts. Lachnus longirostris is widely distributed in Europe. The overwintering eggs of Lachnus longirostris hatch in early summer and develop into small colonies. We have only found this species once and then in low numbers. The images below shows a young colony in late June. 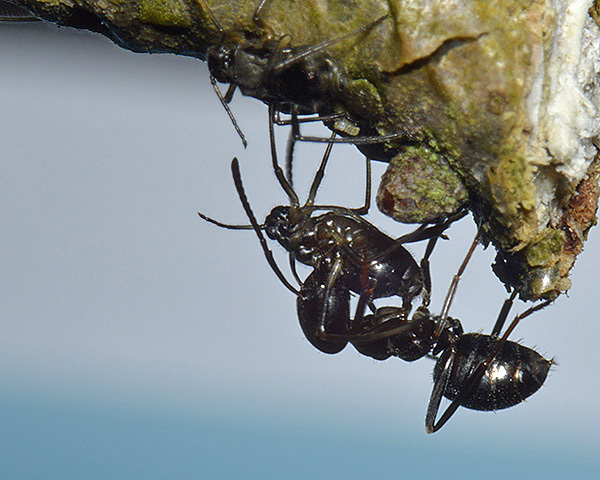 Lachnus longirostris are nearly always attended by ants, most often it seems by Formica species. 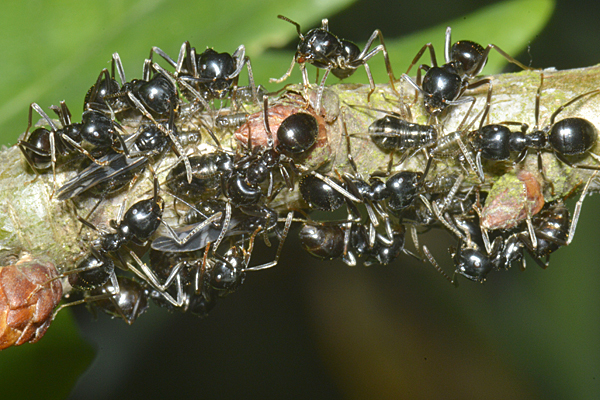 But in this case the aphids were very assiduously tended by jet black ants (Lasius fuliginosus). The ants are very ready to pick up and carry Lasius fuliginosus to a new location if the colony is distrurbed. There is little published information on this species. Lubiarz (2007) reported that over three years of research on Lachnus aphids on oak, Lachnus longirostris was only recorded twice with a total count of only 7 females. Lachnus roboris on the other hand occurred regularly and in large numbers. The scarce variegated oak aphid has a sexual stage in its life cycle. Oviparae and small apterous males develop in October. Egg laying takes place in autumn after mating. 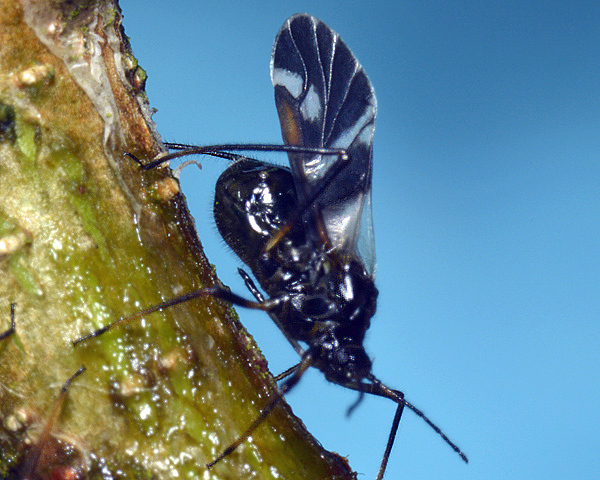 Blackman & Eastop list 34 species of aphid as feeding on common oak (= pedunculate oak, Quercus robur), worldwide, and provide formal identification keys. Of those aphid species, Baker (2015) lists 14 as occurring in Britain: Hoplocallis picta, Lachnus longirostris, Lachnus roboris, Moritziella corticalis, Myzocallis boerneri, Myzocallis castanicola, Phylloxera glabra, Stomaphis quercus, Thelaxes dryophila, Thelaxes suberi, Tuberculatus annulatus, Tuberculatus borealis, Tuberculatus neglectus and Tuberculatus querceus. 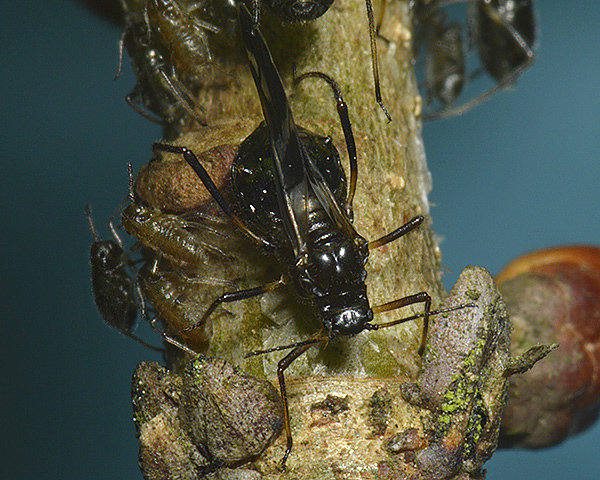 Lachnus longirostris certainly causes feeding damage by rupture of the tree cambium, but since it is rather uncommon, it is unlikely that control of this aphid would ever be considered.